Jerry Colangelo was born on the 20th November 1939, in Chicago Heights, Illinois, USA of American and Italian descent. He is a businessman and sports executive, who is probably best recognized for being the current special advisor to the Philadelphia 76ers, a professional NBA basketball team. He is also known as the director of the USA Basketball national team, and as the former owner of notable teams including the Arizona Rattlers, Phoenix Mercury, etc. His career has been active since the late 1970s. 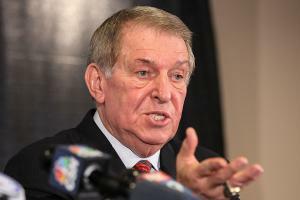 So, have you ever wondered how rich Jerry Colangelo is? It has been estimated by sources that Jerry counts his net worth at the impressive amount of $300 million, as of mid- 2016. Obviously, most of his income is the result of his successful involvement in the sports industry. Another source is coming from selling his autobiographical book entitled “How You Play The Game”. Jerry Colangelo grew up in a middle class family. He attended Bloom Township High School, where he excelled in playing baseball and basketball for the school team. After matriculation, he became a student at the University of Kansas, but transferred to the University of Illinois, where he continued to play basketball for the college team, the Illinois Fighting Illini. Thanks to his skills, Jerry received All-Big Ten Honors, and became the captain of the team in his senior year. In 1962, he graduated with a BA degree in Physical Education. Jerry’s professional career began soon after his college graduation, when he joined the Chicago Bulls as a scout, and later as an assistant to the director, which was the main source of his net worth at the time. However, in 1968, he left the Bulls, and became the general manager of the Phoenix Suns, and that way became the youngest GM in the history of the sport. His first several seasons as the GM of the Suns were unsuccessful, but it would all change later , and the Phoenix Suns became one of the noted franchises of the NBA. His net worth grew accordingly with the success of the club. He eventually passed the franchise to his son Bryan, who served as the GM from 1995 until 2006, becoming even more successful, but Jerry was also the owner of the franchise from 1987 until 2004, when he sold it to Robert Sarver for $401 million, which also included the clubs Phoenix Mercury and the Arizona Rattlers which he owned. This greatly increased his net worth. To speak further of his accomplishments, in 2005, Jerry became the director of the USA basketball national team, which would compete in the 2008 Beijing Olympics and also in the 2010 FIBA World Championship, which also contributed a lot to his net worth. Also, in 2009 he was named as a chairman of the Naismith Memorial Basketball Hall of Fame, a position he still holds. Currently, he is a special advisor to the Philadelphia 76ers, which has also benefited his net worth. During his career, Jerry has received several recognitions and accolades, including Executive Of The Year while a part of the Phoenix Suns, in 1977, 1982, 1990 and 1994. In 2008 he was named to the Phoenix Suns Ring of Honor. Speaking about his personal life, Jerry Colangelo has ben married to Joan for almost 50 years, with whom he has four children – his son Bryan Colangelo was the President of the Toronto Raptors team. In his spare time, Jerry is very active as a philanthropist, as he is the chairman of the National Italian American Foundation (NIAF), which promotes Italian and American cultures. Place Of Birth Chicago Heights, Illinois, U.S.
1 Invited Jeff Hornacek to a Phoenix Suns pre-draft try out at the request of Bobby Knight, who had been contacted by Hornacek's father. Colangelo took Hornacek 46th overall in the 1986 NBA draft. 3 Former managing general partner of the NBA's Phoenix Suns, and former managing general partner of MLB's Arizona Diamondbacks. Inducted into the Basketball Hall of Fame in 2004.